Earth Friendly Furniture Polish is made from natural olive and orange oils. 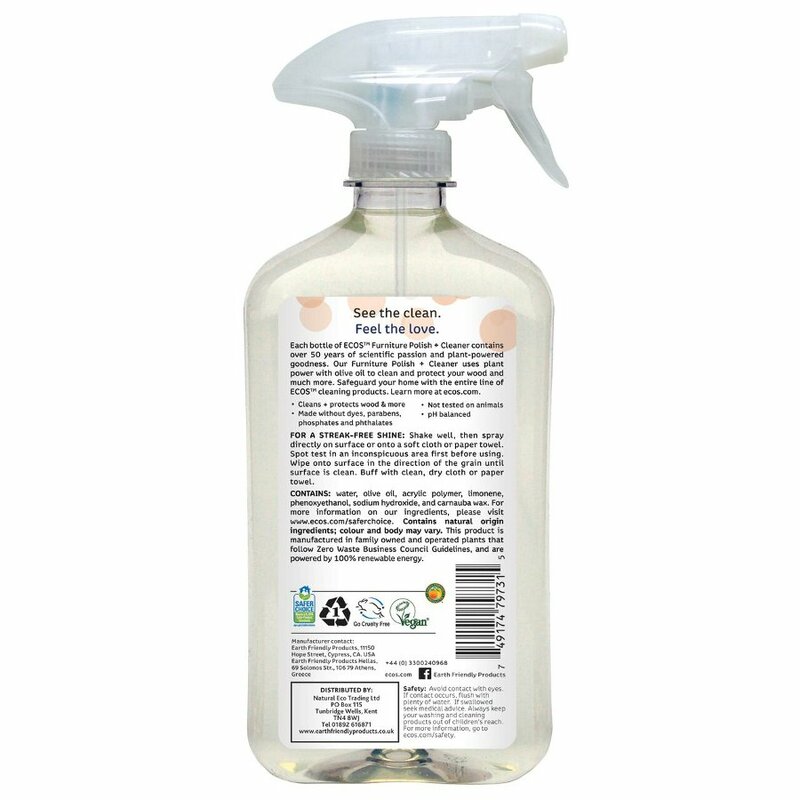 It cleans and beautifies wood, formica, particle board and vinyl surfaces. Non-polluting / 100% biodegradable / non-toxic / natural. For everyday cleaning and dusting of furniture. Shake bottle before using. Turn nozzle to spray setting and lightly spray furniture to be cleaned from about 20 cm away. Wipe immediately with soft clean cloth. Note: If finish of furniture is not known then spray on an inconspicuous area first and check results. Furniture Polish is a water based product and so does not mix with bees wax based polishes and will clean the wax away. Do not use as a floor polish as it may make floor slippery. 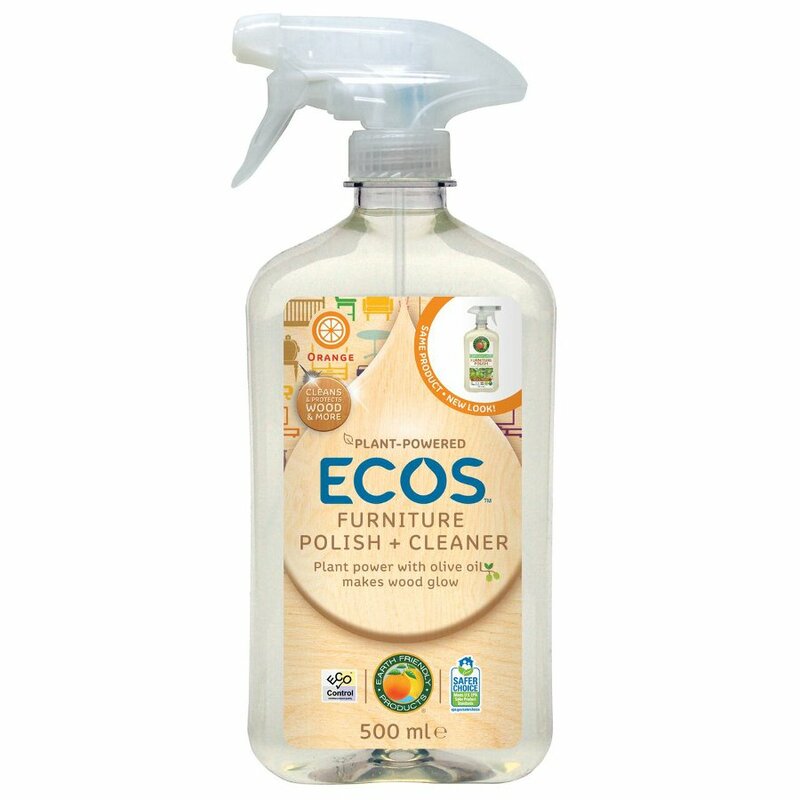 The ECOS Furniture Polish & Cleaner - 500ml product ethics are indicated below. To learn more about these product ethics and to see related products, follow the links below. Love this product, smells great and brings a lovely shine to my furniture. Hard to find furniture polish in recycleable containers except this one. I've used it before and it's fine - nice smell. Q: Could you please tell me if this product contains ingredients derived from GMO's, thank you. A: Hi there, Many thanks for your query. This product is free from GMO ingredients. I hope this helps.